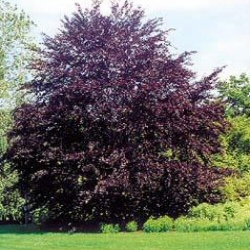 Purple Beech is a majestic tree worthy of inclusion because of its distinctive red leaves. In spring, the leaves are an attractive brownish-pink but soon change to their distinctive blackish-purple colour. This tree is supplied at a height of between 1.0 and 2.6 metres in a 5-12L container for year round planting and better results than from bare-root stock or rootballed stock. Expect a final height of up to 35m (117ft). Generally speaking the Fagus sylvatica Purpurea in smaller pots e.g 5-7 litres are round 2 years old depending when in the season you buy them. The larger pots e.g 10-15 litres are 3+ years old. 100cm+ : Usually 5 litre pot and 2-3 years old. 180-220cm : Usually a 12 litre pot and 3-4 years old.